50 per cent of all console games will be produced in 3D by 2012, according to French publisher Ubisoft. Around 15 to 20 per cent of current consoles' games will get 3D versions over the next year, a Ubisoft rep outlined this week. 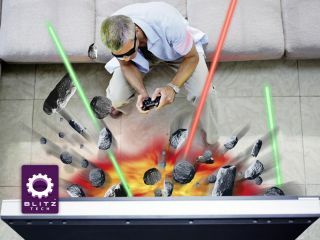 3D TVs are only just beginning to arrive on the market, with many predicting that it is gaming that will drive the march of 3D into the home, followed by movies and TV shows. "We will see more and more product coming in 3D on 360 and PS3 but also on portable machines," said a Ubisoft rep in a recent investors call. "We can count on substantial grown in the 3D market just because it's more immersive, so it will be a good way for the industry to give even more emotion to the gamers. "I think next year we should see maybe 15-20% of games will be 3D on next-gen consoles ... and the following year will be at least 50% of the games." 3D gaming is certainly going to be one of the big themes at this year's E3, with Nintendo set to reveal its new glasses-free 3D handheld.